Intricately designed and a unique masterpiece in itself, the Avra is an expression of creativity. Made from silver, it is a distinctive piece, exclusively designed and is a synonym of beauty and grace. The lotus and the hand mudras symbolize enlightenment and creativity. Add a touch of serenity and positivity to the surroundings of your offices and homes. Intricately designed and a unique masterpiece in itself, the Avra is an expression of creativity. 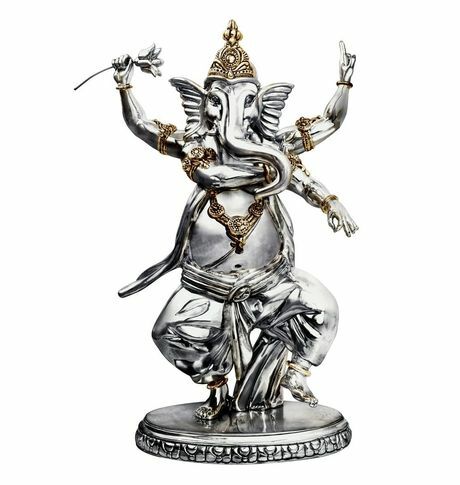 Made from silver, it is a distinctive piece, exclusively designed and is a synonym of beauty and grace. The lotus and the hand mudras symbolize enlightenment and creativity. Add a touch of serenity and positivity to the surroundings of your offices and homes. Electroformed Silver Finish Color: Silver Exclusive Design Base Material: Resin. Easy to maintain.Cancellation and Return Policy: • Exchange allowed post booking • No order cancellation or Refund transaction allowed at the store.